Try this Mystery Letters activity with your Preschooler or Kindergartener. They will use what characteristics they know about the letters to pick out the right one. 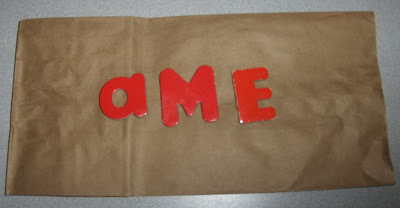 I had B pick out 3 Melissa and Doug magnetic letters and we put them into a brown paper bag. I asked him if he could reach his arm in and pick out the letter E without looking. To find it without looking, they really have to know and feel for the different characteristics of a letter. He did it once without looking but then he refused to do it unless he could look. I stopped myself from fussing with him about it because I realized who cares if he is looking. The real goal is to have fun while identifying letters. No matter what is in the bag, they are following directions and thinking or looking for different characteristics. *Pick out the letters myself – I would start by using letters that have distinct characteristics like a T, O, and B for example. I think the M and the E were too similar for the first time with this activity. *I would start with something simpler like shapes or small toys to introduce the activity before jumping in with the letters. i tried this with my kids–we used toys that they had picked out! i put them one at a time into a pillowcase and they had to reach in and guess which toy it was! they couldn’t do it! i was totally shocked! they are 6 and 3! i thought it would be soooo easy, especially since they picked the toys! but they were guessing things they hadn’t even picked! but, they did say it was fun! I love that you share what you’d do differently next time… it’s a big help to those of us following in your footsteps! We haven’t done letters but we’ve played this game with small objects lots of times. What a great activity for letter recognition. I like that this is versatile and you could use it for shapes, numbers etc. The tips for what you would do differently are excellent. I would be delighted if you were to feature the texture cards I made. Feel free to use the photo as well. When Savvy was little I also made a texture jigsaw puzzle which she really liked. I need to make some more textured things as Blake seems to also enjoy these experiences. What a super idea. I think we will try something like this! Sweet Pea would love it.